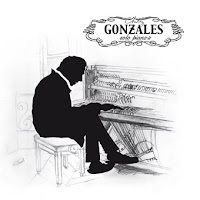 There's no doubt that Chilly Gonzales is most widely known for his efforts producing records for Feist. However, it shouldn't be forgotten that he has a vibrant and, um, eclectic career making his own music. His latest project is the forthcoming album Solo Piano II. Out August 28th, this record is his second collection of original piano compositions. Gonzales' explorations run the gamut on this new album. Most of the tracks are elaborately constructed, but there are intimate moments ("Rideaux Lunaires"). He can be playful ("Evolving Doors", "Papa Cavotte") and jaunty ("Nero's Nocturne") as easily as he can make dark and sinister music ("Escher", "Taratelle"). Not every track is a winner. The album is book-ended by a pair of rather cheesy numbers. The opener, "White Keys", is a not-too-distant relative of the "Chariots Of Fire Theme", while the closer "Uncle" is worthy of the schmaltziest lounge lizard act. This is not a record for the rock fan though. Unless you have a great appreciation for classical music, which I do not, you will find this to be no more than background music. It's lovely background music, but background music nonetheless. Best tracks: "Nero's Nocturne", "Tarantelle"